Hi! My name is Lauren and I study biology and environmental studies at Trinity University. One of my favorite ways to learn about biology and the environment is by studying lizards with Dr. Johnson in her lab! In the lab, I get to compare the personalities of different types of lizards. There are many different species of lizards in Texas, and I want to know why some lizards are better at living in new habitats than other lizards. Animals that are experts at moving into new habitats are called invasive species. Invasive species can damage the environment where they make their new homes, and they can force the animals already living there to compete for food and places to live. Scientists study invasive species to understand how they manage to spread and thrive in new habitats, and to try to protect natural habitats from being overrun by invasive species. I study the behaviors (or the “personalities”) of invasive lizards in Texas, and of other lizard species that are native to Texas. I want to understand how the invasive lizards are different from the native lizards and to see what behaviors the invasive lizards display that make them successful at living in new environments. I predicted that the invasive lizards would be “bolder” than the native lizards, meaning that the invasive lizards would be more aggressive and more ready to explore new areas. To measure this, I designed four different tests for each lizard to complete. I worked with the other students in our lab to run these tests. In the first test, we measured how long it took for a lizard to eat a cricket. In the second test, we measured how lizards fight with other lizards from their species. We also measured how active each lizard was, or in other words, how much it moved around an open space. 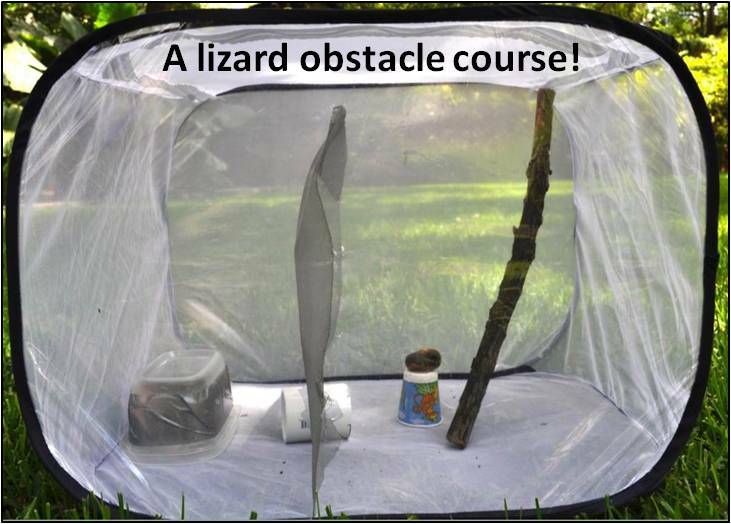 And finally, we measured each lizard’s ability to explore an obstacle course (see the picture above)! So far, we have found some results that support my prediction that invasive lizards are bolder than native lizards, and other results that don’t. Sometimes science projects require us to explain results even when they do not show what we thought would happen, and I am currently working to figure out why only some of the results agree with my predictions. I am also looking at the cells in the brains of both invasive and native lizards to see if there are any differences in parts of the brain associated with their bold personalities. I don’t have any results from that work yet, but I think that the brain cells of invasive and native lizards will be different. I’ll let you know what I find! Lauren is studying Biology and Environmental Studies at Trinity University. She loves to be outdoors - she'll go camping every chance she gets!